If you have been charged with a crime in Virginia, the process may seem confusing, and you probably do not know what to expect. While the court process will vary slightly depending on whether you were charged in Fairfax or another jurisdiction, the basic procedure is the same. Like in other states, there are two categories of crimes in Virginia: misdemeanors and felonies, which carry very different penalties. Misdemeanors are punishable by a maximum sentence of one year in jail, whereas you could face a lengthy prison sentence in a state penitentiary if you are convicted of a felony. The court procedures are also very different for misdemeanors and felonies. Here, we discuss what to expect if you are charged with a misdemeanor offense. What Is the Arrest Procedure in Virginia? The first step in a criminal case is charging a person with a crime. This is done through the issuance of a summons or a warrant. A warrant is issued by a judicial officer—often a magistrate—who makes a decision that there is probable cause to believe the person committed a crime. The warrant authorizes the police to arrest the person and bring him to court. If you are arrested on a warrant, you may need to post a bond to be released from jail. A bond is a written promise from you to return to court hearings and a payment of a certain amount that is forfeited if you violate the terms of your bond. A summons is not issued by a judge or magistrate. Instead, the police officer issues it, and the summons will direct you to appear at court on a particular date at a certain time. Usually you are released without having to go to jail or post a bond. Arraignment. Your first hearing after being charged with a misdemeanor will be an arraignment—also known as an advisement—although some judges will skip this step and set a case for trial. You do not need to enter a plea or present witnesses at this hearing. The purpose is to advise you of the criminal charges, set a trial date, and determine whether or not you qualify for a public defender. Trial. 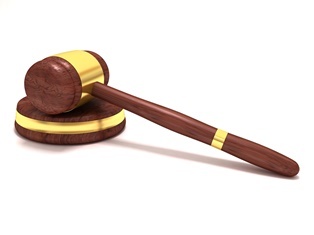 All criminal trials in district court are bench trials, meaning that they are decided by a judge, not a jury. This hearing is the first opportunity for your attorney to talk to the prosecutor, the police officer, and any witnesses, and receive any discovery. If your case is not resolved by a plea agreement, it will most likely be continued and set for another trial date. At your trial, you will have the right to raise your defenses and present witnesses. At the end of the trial, the judge will find you either guilty or not guilty of the crime you are charged of committing. Appeal to Circuit Court. If you are not happy with the result in district court, you have a right to appeal the decision to circuit court. This is different than a traditional appeal. Your case starts over again as if there had been no trial, and you have a right to a jury trial. Further appeals. If you disagree with the decision in circuit court, you can file an appeal with the Virginia Court of Appeals and Supreme Court. However, there is no trial, and neither court has to agree to allow your appeal. Appeals are generally only granted when the circuit court judge made a significant mistake. What Are the Penalties That You Could Face? No matter what classification of misdemeanor you are convicted of, you will have a permanent criminal record that can affect other aspects of your life long after you complete your sentence. With the help of an experienced criminal defense attorney, you may be able to get the charges dismissed or reduced to a less serious offense. Start an online chat today to schedule your free case evaluation to learn how our criminal defense team may be able to help you.